Climbing hardware refers to all the parts and pieces that allow the trained mountain soldier to accomplish many tasks in the mountains. The importance of this gear to the mountaineer is no less than that of the rifle to the infantryman. a. Carabiners. 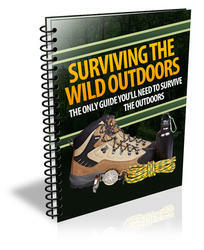 One of the most versatile pieces of equipment available to the mountaineer is the carabiner. This simple piece of gear is the critical connection between the climber, his rope, and the protection attaching him to the mountain. Carabiners must be strong enough to hold hard falls, yet light enough for the climber to easily carry a quantity of them. Today's high tech metal alloys allow carabiners to meet both of these requirements. Steel is still widely used, but is not preferred for general mountaineering, given other options. 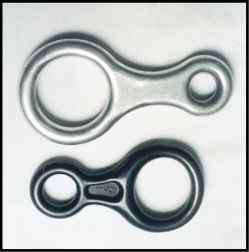 Basic carabiner construction affords the user several different shapes. The oval, the D-shaped, and the pear-shaped carabiner are just some of the types currently available. Most models can be made with or without a locking mechanism for the gate opening (Figure 3-11, page 3-12). If the carabiner does have a locking mechanism, it is usually referred to as a locking carabiner. When using a carabiner, great care should be taken to avoid loading the carabiner on its minor axis and to avoid three-way loading (Figure 3-12, page 3-12). Note: Great care should be used to ensure all carabiner gates are closed and locked during use. Figure 3-12. Major and minor axes and three-way loading. 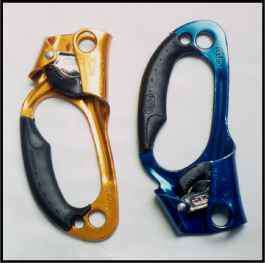 (1) The major difference between the oval and the D-shaped carabiner is strength. Because of the design of the D-shaped carabiner, the load is angled onto the spine of the carabiner thus keeping it off the gate. The down side is that racking any gear or protection on the D-shaped carabiner is difficult because the angle of the carabiner forces all the gear together making it impossible to separate quickly. (2) The pear-shaped carabiner, specifically the locking version, is excellent for clipping a descender or belay device to the harness. They work well with the munter hitch belaying knot. (3) Regardless of the type chosen, all carabiners should be UIAA tested. This testing is extensive and tests the carabiner in three ways—along its major axis, along its minor axis, and with the gate open. b. Pitons. A piton is a metal pin that is hammered into a crack in the rock. They are described by their thickness, design, and length (Figure 3-13, page 3-14). Pitons provide a secure anchor for a rope attached by a carabiner. The many different kinds of pitons include: vertical, horizontal, wafer, and angle. They are made of malleable steel, hardened steel, or other alloys. The strength of the piton is determined by its placement rather than its rated tensile strength. The two most common types of pitons are: blades, which hold when wedged into tight-fitting cracks, and angles, which hold blade compression when wedged into a crack. (1) Vertical Pitons. On vertical pitons, the blade and eye are aligned. 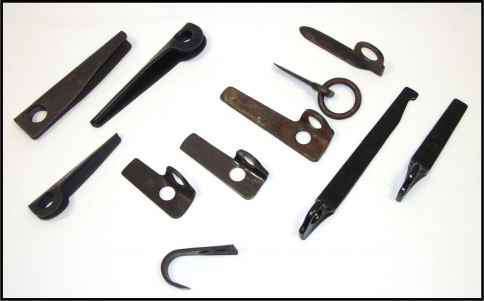 These pitons are used in flush, vertical cracks. (2) Horizontal Pitons. On horizontal pitons, the eye of the piton is at right angles to the blade. These pitons are used in flush, horizontal cracks and in offset or open-book type vertical or horizontal cracks. They are recommended for use in vertical cracks instead of vertical pitons because the torque on the eye tends to wedge the piton into place. This provides more holding power than the vertical piton under the same circumstances. (3) Wafer Pitons. These pitons are used in shallow, flush cracks. They have little holding power and their weakest points are in the rings provided for the carabiner. (4) Knife Blade Pitons. 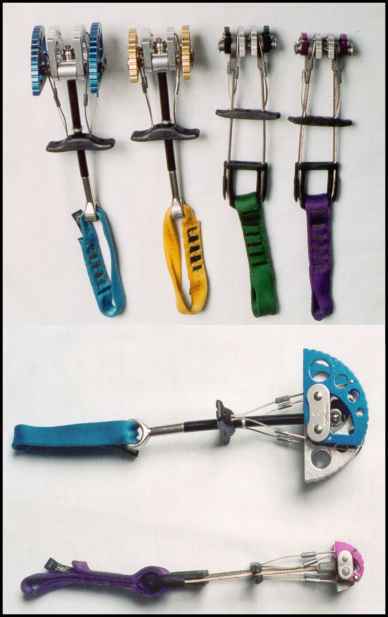 These are used in direct-aid climbing. They are small and fit into thin, shallow cracks. They have a tapered blade that is optimum for both strength and holding power. (5) Realized Ultimate Reality Pitons. 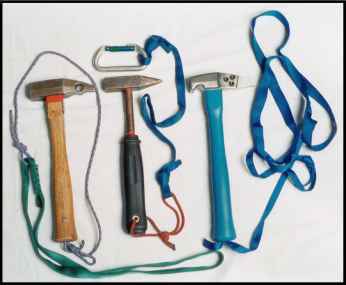 Realized ultimate reality pitons (RURPs) are hatchet-shaped pitons about 1-inch square. They are designed to bite into thin, shallow cracks. (6) Angle Pitons. These are used in wide cracks that are flush or offset. Maximum strength is attained only when the legs of the piton are in contact with the opposite sides of the crack. (7) Bong Pitons. These are angle pitons that are more than 3.8 centimeters wide. Bongs are commonly made of steel or aluminum alloy and usually contain holes to reduce weight and accommodate carabiners. They have a high holding power and require less hammering than other pitons. (8) Skyhook (Cliffhangers). These are small hooks that cling to tiny rock protrusions, ledges, or flakes. 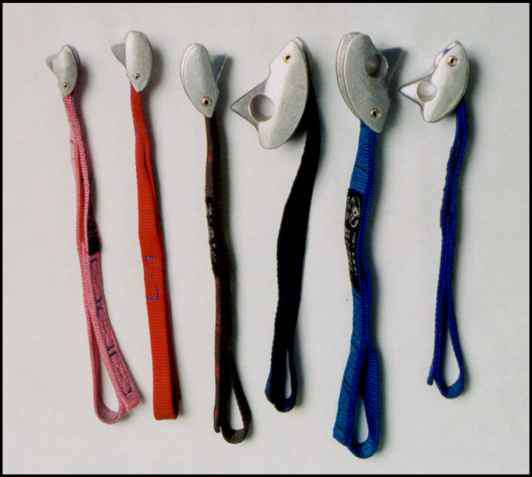 Skyhooks require constant tension and are used in a downward pull direction. The curved end will not straighten under body weight. The base is designed to prevent rotation and aid stability. c. Piton Hammers. A piton hammer has a flat metal head; a handle made of wood, metal, or fiberglass; and a blunt pick on the opposite side of the hammer (Figure 3-14). A safety lanyard of nylon cord, webbing, or leather is used to attach it to the climber The lanyard should be long enough to allow for full range of motion. Most hammers are approximately 25.5 centimeters long and weigh 12 to 25 ounces. The primary use for a piton hammer is to drive pitons, to be used as anchors, into the rock. The piton hammer can also be used to assist in removing pitons, and in cleaning cracks and rock surfaces to prepare for inserting the piton. The type selected should suit individual preference and the intended use. d. Chocks. "Chocks" is a generic term used to describe the various types of artificial protection other than bolts or pitons. Chocks are essentially a tapered metal wedge constructed in various sizes to fit different sized openings in the rock (Figure 3-15). The design of a chock will determine whether it fits into one of two categories—wedges or cams. A wedge holds by wedging into a constricting crack in the rock. A cam holds by slightly rotating in a crack, creating a camming action that lodges the chock in the crack or pocket. Some chocks are manufactured to perform either in the wedging mode or the camming mode. One of the chocks that falls into the category of both a wedge and cam is the hexagonal-shaped or "hex" chock. This type of chock is versatile and comes with either a cable loop or is tied with cord or webbing. All chocks come in different sizes to fit varying widths of cracks. Most chocks come with a wired loop that is stronger than cord and allows for easier placement. 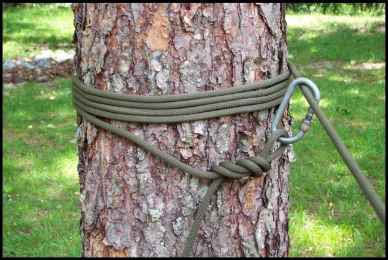 Bigger chocks can be threaded with cord or webbing if the user ties the chock himself. Care should be taken to place tubing in the chock before threading the cord. The cord used with chocks is designed to be stiffer and stronger than regular cord and is typically made of Kevlar. The advantage of using a chock rather than a piton is that a climber can carry many different sizes and use them repeatedly. e. Three-Point Camming Device. The three-point camming device's unique design allows it to be used both as a camming piece and a wedging piece (Figure 3-16). Because of this design it is extremely versatile and, when used in the camming mode, will fit a wide range of cracks. The three-point camming device comes in several different sizes with the smaller sizes working in pockets that no other piece of gear would fit in. Figure 3-16. Three-point camming device. f. Spring-Loaded Camming Devices. Spring-loaded camming devices (SLCDs) (Figure 3-17) provide convenient, reliable placement in cracks where standard chocks are not practical (parallel or flaring cracks or cracks under roofs). SLCDs have three or four cams rotating around a single or double axis with a rigid or semi-rigid point of attachment. These are placed quickly and easily, saving time and effort. SLCDs are available in many sizes to accommodate different size cracks. Each fits a wide range of crack widths due to the rotating cam heads. The shafts may be rigid metal or semi-rigid cable loops. The flexible cable reduces the risk of stem breakage over an edge in horizontal placements. Figure 3-17. Spring-loaded camming devices. g. Chock Picks. Chock picks are primarily used to extract chocks from rock when the they become severely wedged (Figure 3-18). They are also handy to clean cracks with. Made from thin metal, they can be purchased or homemade. When using a chock pick to extract a chock be sure no force is applied directly to the cable juncture. One end of the chock pick should have a hook to use on jammed SLCDs. h. Bolts. Bolts are screw-like shafts made from metal that are drilled into rock to provide protection (Figure 3-19). 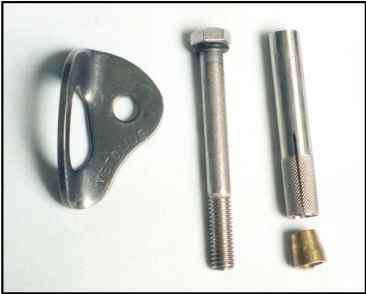 The two types are contraction bolts and expansion bolts. Contraction bolts are squeezed together when driven into a rock. Expansion bolts press around a surrounding sleeve to form a snug fit into a rock. Bolts require drilling a hole into a rock, which is time-consuming, exhausting, and extremely noisy. Once emplaced, bolts are the most secure protection for a multidirectional pull. Bolts should be used only when chocks and pitons cannot be emplaced. A bolt is hammered only when it is the nail or self-driving type. (1) A hanger (for carabiner attachment) and nut are placed on the bolt. The bolt is then inserted and driven into the hole. Because of this requirement, a hand drill must be carried in addition to a piton hammer. Hand drills (also called star drills) are available in different sizes, brands, and weights. A hand drill should have a lanyard to prevent loss. (2) Self-driving bolts are quicker and easier to emplace. These require a hammer, bolt driver, and drilling anchor, which is driven into the rock. A bolt and carrier are then secured to the emplaced drilling anchor. All metal surfaces should be smooth and free of rust, corrosion, dirt, and moisture. Burrs, chips, and rough spots should be filed smooth and wire-brushed or rubbed clean with steel wool. Items that are cracked or warped indicate excessive wear and should be discarded. Figure 3-19. Bolts and hangers. i. Belay Devices. 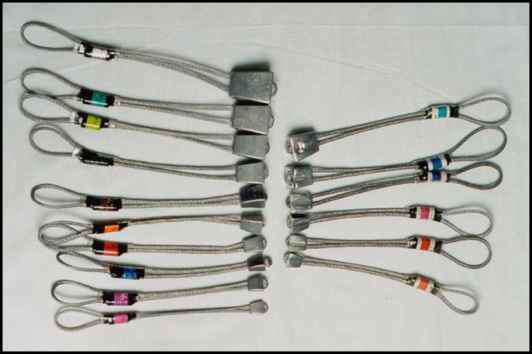 Belay devices range from the least equipment intensive (the body belay) to high-tech metal alloy pieces of equipment. Regardless of the belay device choosen, the basic principal remains the same—friction around or through the belay device controls the ropes' movement. 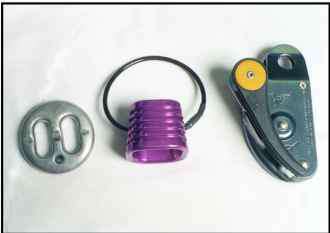 Belay devices are divided into three categories: the slot, the tuber, and the mechanical camming device (Figure 3-20). (1) The slot is a piece of equipment that attaches to a locking carabiner in the harness; a bight of rope slides through the slot and into the carabiner for the belay. 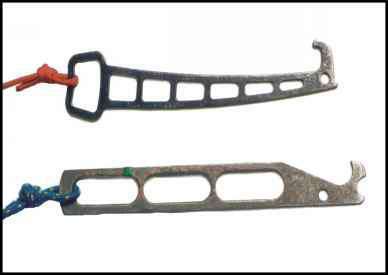 The most common slot type belay device is the Sticht plate. (2) The tuber is used exactly like the slot but its shape is more like a cone or tube. (3) The mechanical camming device is a manufactured piece of equipment that attaches to the harness with a locking carabiner. The rope is routed through this device so that when force is applied the rope is cammed into a highly frictioned position. Figure 3-20. Slot, tuber, mechanical camming device. j. Descenders. One piece of equipment used for generations as a descender is the carabiner. A figure-eight is another useful piece of equipment and can be used in conjunction with the carabiner for descending (Figure 3-21). Note: All belay devices can also be used as descending devices. k. Ascenders. Ascenders may be used in other applications such as a personal safety or hauling line cam. All modern ascenders work on the principle of using a cam-like device to allow movement in one direction. Ascenders are primarily made of metal alloys and come in a variety of sizes (Figure 3-22). For difficult vertical terrain, two ascenders work best. For lower angle movement, one ascender is sufficient. Most manufacturers make ascenders as a right and left-handed pair. l. Pulleys. Pulleys are used to change direction in rope systems and to create mechanical advantage in hauling systems. A pulley should be small, lightweight, and strong. They should accommodate the largest diameter of rope being used. Pulleys are made with several bearings, different-sized sheaves (wheel), and metal alloy sideplates (Figure 3-23). Plastic pulleys should always be avoided. The sideplate should rotate on the pulley axle to allow the pulley to be attached at any point along the rope. For best results, the sheave diameter must be at least four times larger than the rope's diameter to maintain high rope strength.